Verzasca Dam is located in Ticino, Switzerland, became bungy jumping site which very challenging. Bungy jumping is a special place for people who really have the guts. Falls from height and allowed to swing and hang enough to get people to think long to try it. 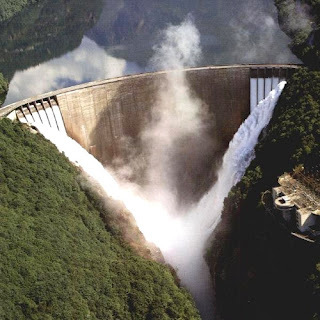 dam which also known as the Contra Dam, has a height of about 220 meters (720 feet). This location is estimated as the highest bungy jumping in the world. Already more than 10,000 people which jumped from the top of this dam. This place became famous as it appears at the beginning of the movie "Golden Eye". At that Bond must enter the Arkhangelsk, place in a fictional film which is expressed as where storage chemicals for weapons in the north of the Soviet Union during the Cold War. To enter this place Bond agents must jump from the Verzasca Dam which very steep. A flat concrete surface with rock cliffs on the right and left makes the panorama building which was formed in May 1960 looks very impressive. Not to mention that looks very flat surface capable of providing a challenge for anyone who wants defeated him. Since the film was aired 007 rahasisa agent, where it became one of which must-see tourist destinations. Yes, although not all of them tested the courage to jump from the top. There are jumps, photographed, or simply see it as "sort out" the chest is enough to make the heart beat. For tourists are want to make the leap this challenge must have a healthy physical and mental condition. To maintain the security of tourists, the manager also provides a companion are was very professional. Wush! Approximately 7.5 seconds of jumping will oscillate at the magnificent ntara Verzasca Dam. Funny thing is, many tourists who jumped with the style of James Bond. Because tourists are very high, the manager of this Verzasca dam also provides access to the location. Locations that are near the town of Locarno can be reached by train from the station Tenero, Locarno, or Bellinzona. Or use the bus for 2 hours travel time from the starting point of the same trip by train. 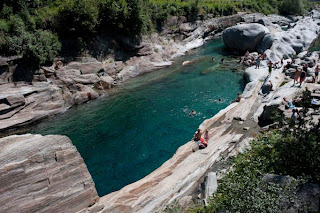 Not only do bungy jumping, here tourists can see the beauty of emerald green Verzasca River. This river provides a beautiful scenery with panoramic views of the Alps are graceful. Interestingly, in this river water is not only able to play any traveler would be able to do the dive, you know. Wow, diving in the river!